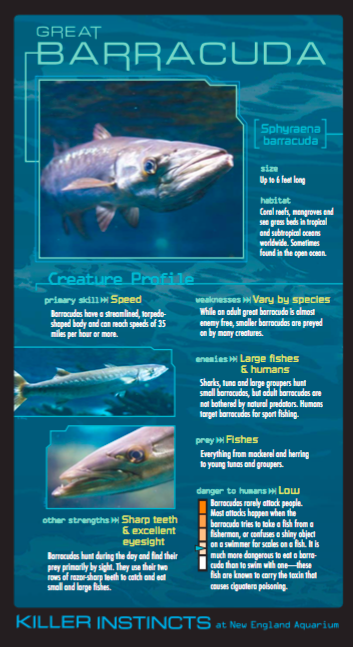 The fifth in a series of popular themed exhibits, Killer Instincts helps New England Aquarium visitors discover the truth about sharks, anacondas, great barracudas, electric eels, and more. 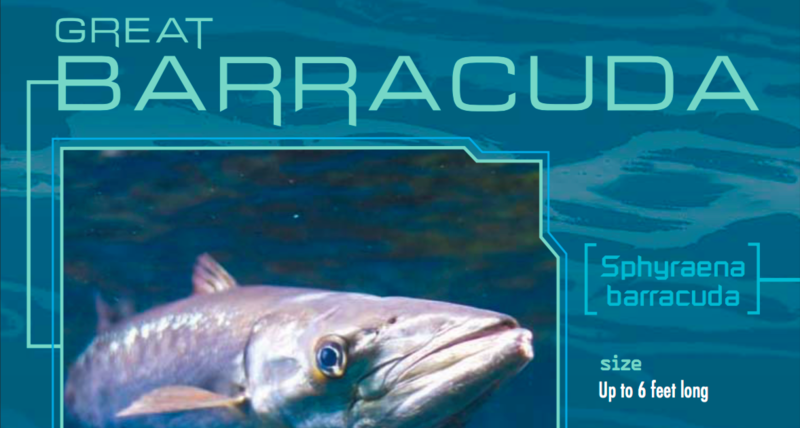 Aquarium visitors are provided with a Killer Instincts passport, which they use to guide their exploration of the exhibit. Each stop includes an interpretive panel and a small stamping station where visitors can stamp their passport to record their journey. 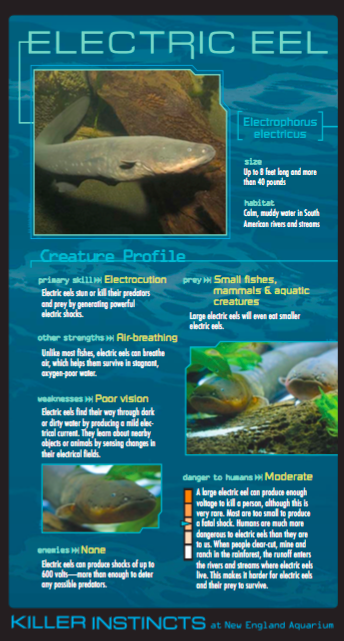 Each exhibit panel features a different “killer” animal, and shares the truth about their deadly and not-so-deadly ways, emphasizing fun facts and little-known trivia about each supposedly dangerous creature. 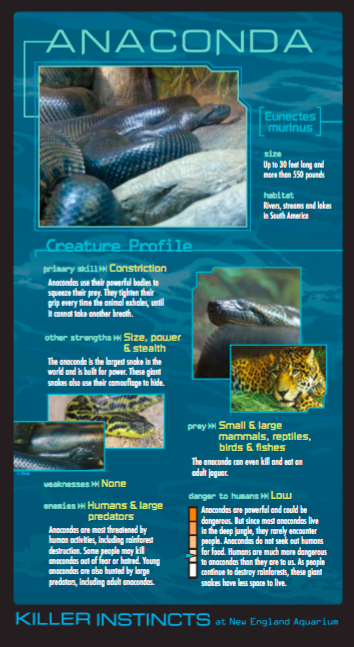 Surprising facts include electric eels’ poor eyesight, anacondas’ ability to eat jaguars, and barracudas’ top speed—approximately 35 miles per hour! How “killer” are these animals? For the most part, not very. 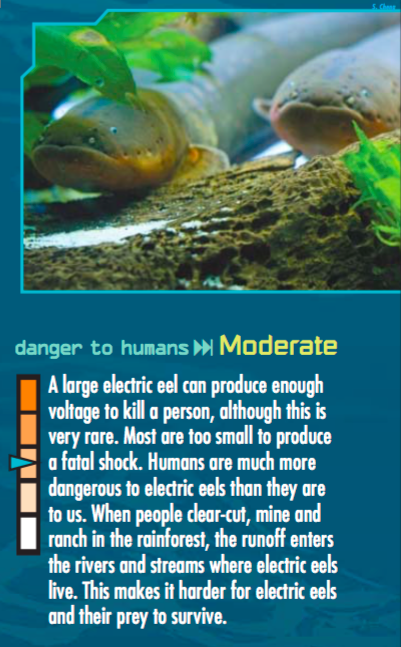 Each Killer Instincts exhibit panels features a “Danger to Humans” meter, and few animals exceed moderate, including the electric eel (at right).